Democratic presidential hopeful Beto O’Rourke barnstormed through Southeast Michigan on Monday, making a play for union workers who could be decisive in both the 2020 Democratic presidential primary and the general election. “When I talked about this economy that has the greatest level of wealth and income inequality of our lifetimes, [that’s] totally correlated with the decline in the unions’ strength and power in this country,” the former Texas congressman said at the Carpenters training center in Ferndale. Unions have taken hits in Michigan, particularly during the prior eight years when Republicans controlled all three branches of government. In December 2012, Michigan — the home of the UAW — made international headlines when Republicans pushed through Right to Work legislation. In 2016, now-President Donald Trump successfully peeled away some union members from the Democratic coalition, helping to give him a narrow, 10,704-vote victory in Michigan over Hillary Clinton. Two years later, however, Democrat Gretchen Whitmer won a decisive, 9-point victory for governor. O’Rourke, best known for his unsuccessful challenge to U.S. Sen. Ted Cruz (R-Texas) in 2018, held a roundtable with welding students after touring the facility. He talked about the concern that parents like him have that their children may earn less than they do. “As unions have, in some states, diminished in power, as we’ve tied their hands and their ability to bargain and negotiate for the value they provide to contractors — but really, to the the country — you’ve seen people be able to earn less,” he said. “You’ve seen less growth in the middle class and you have parents — I’m the parent of three; you all may be parents, as well — who face the prospect of their kids maybe earning less than they did And we can’t be that country — can’t allow that to happen. O’Rourke called Michigan an “important” state and said it was a priority to come here soon after he declared for president on Thursday. “I wanted to be here in this state as early as I possibly could,” he said. He started out his day in a Center Line coffee shop in Macomb County before heading to Oakland County. The former congressman added a stop in Detroit cafe before campaigning in neighboring Ohio. Several Democratic officials joined O’Rourke in Ferndale, including, state Sen. Jeremy Moss (D-Southfield), Ferndale Mayor Dave Coulter and University of Michigan Regent Jordan Acker. U.S. Sen. Kirsten Gillibrand (D-N.Y.) also will be doing two events in Oakland County on Monday, including an MSNBC town hall. Whitmer will join her. As the Advance reported, she wasn’t able to to any events with O’Rourke, but the two did speak on the phone. Although his candidacy has taken plenty of fire from skeptical Democrats and Washington, D.C., journalists, O’Rourke announced on Monday that he’d raised $6.1 million — more than any other Democratic contender, including U.S. Sen. Bernie Sanders (I-Vt.), who won Michigan’s ‘16 primary. Still, Republicans pounced on his visit. Trump announced a rally in Grand Rapids on March 28. O’Rourke was asked about trade agreement, which has been a big issue in Michigan, and whether he supported workers organizing in other countries. “Let’s just make sure that we’re trading on a level playing field — that those workers in those other countries also have the right to organize so that they’re paid a higher wage and have better working conditions so it doesn’t make us compete at an unfair playing field,” O’Rourke said. 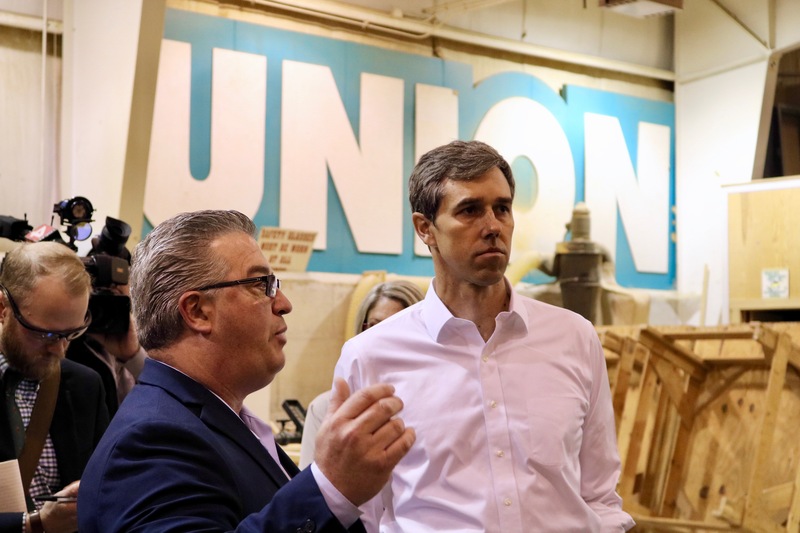 During the tour of the Carpenters facility, Michigan Regional Council of Carpenters and Millwrights President Tom Lutz told O’Rourke that Michigan’s infrastructure needs repair. That is, of course, Whitmer’s top priority and she’s proposed a $2.5 billion roads plan in her fiscal year 2020 budget. O’Rourke said he noticed the potholes. “I can already tell, just from driving from the airport to our hotel last night,” he said. “When we invest in infrastructure we invest in jobs — the kinds of jobs we’re training for right here. Republicans and Democrats — this shouldn’t divide us. We should be investing in infrastructure,” he said. O’Rourke praised the Carpenters’ training programs, noting that there was a skills gap in his hometown. “I’m from El, Paso, Texas, where we’ve had an embarrassment of wealth and construction projects over the last 15 years … and what we were missing was the skilled and trained workforce to do those jobs,” he said. O’Rourke said that there have to be more skilled trades opportunities available. He also said it’s important to “treat people who literally build this country with respect. “So I’ve always thought about college-ready — and I think that’s important — but I’m now beginning to think of career-ready,” he said at the roundtable. O’Rourke, who was in a punk rock band, was asked by a reporter what he was “jamming to” on the drive over. The Democrat laughed.